‘A school which benefited from a share of a £20m Welsh government investment to improve it has been put in special measures. Ysgol Bryn Alyn in Gwersyllt received a damning report from inspectors,who highlighted pupils having little interest in lessons and weak literacy and numeracy skills. The report also found teaching was not effective, and that teachers had a lack of faith in their students. The school had received funding through the Challenge Cymru programme aimed at improving 40 schools in some of Wales’ most deprived areas. You draw attention to some vital points Helen, some of which counter elements of Matt’s interesting observations above. I would always argue that more money is vital in Education. To say differently would be silly. Equally, as the Daily Post report suggests, success in Education is never guaranteed by it. Reference is made to a number of negatives in this school, but, in fairness, these observations could be made about many schools across Wales. Most people of a certain age and generation have no idea how a modern classroom in Wales operates, Wales allowing no choice in the nature of Secondary Schooling (bar language and faith). Schools are not selective nor indeed, as with Academies, are they elective. There is a form of choice available, in that you can opt for a different school than the local one to your house, but this all tends to be a bit of a lottery and is often very inconvenient. The schools rarely stream and even setting is only available in certain subjects, becoming more common further up the age range. The buzz-word for years has been Child-Centred Education, which is the logical consequence of Mixed ability classes, and in a subject like History or Geography that often means year groups containing a range of academic variables, many with reading ages of a huge contrast. In theory, a Teacher is no longer supposed to teach from the front, and will have to use common-denominator language when they do. The contrasting abilities demand that the teacher sets variable work for each group and will move around groups inspecting work produced and helping the individuals and groups within the class. All of this requires small groups to be effective and if the money sourced is not allocated to reducing groups, chaos will ensue. Just did some background reading into the Challenge Cymru scheme and when it was mentioned here, I was not expecting it to be mired in the type of issues mentioned in these articles. It just paints a very sad picture on the effectiveness of the Welsh Government at delivering effective funding programmes to improve critical elements of society within Wales, such as education. 1) When it was founded, it was underfunded – £12m was provided by the UK Government, but the Welsh Government was expected to find another £8m internally within Wales. At least £5m of that was believed to have been taken directly from 3 other school improvement grants in Wales – both opposition parties and teaching unions expressed their concerns. So as the article says effectively ‘robbing Peter to pay Paul’. 2) This article suggests that the programme was meant to be longer term, but plans came in place very quickly to axe it after 3 years. There are mentions that the scheme was criticised after just 12 months for having mixed results – some schools seeing improvement, but others not yet seeing a boost. A similar picture after 18 months meant that they decided it would be halted after 3 years. Now if you ask me, 12 or 18 months is not a sufficient period of time to see a major upturn in improvement in something as big and difficult as a secondary school. It’s the same delusions that certain football chairmen/fans have over expectations of seeing a slumping football team starting to win trophies with the installation of a new manager before even being given a chance to build a new team. You have to ask, as other people have mentioned in this thread before, why are they not getting successful similar schools to share their expertise with failing schools? They should have taken on board the lessons in the improving Challenge Cymru schools and tried to apply that where no results were being seen. It seems more the case that the scheme could not be afforded to be ran in times of austerity and they were finding any reasoning to knock it on the head. There was major questioning in the Assembly as to why a full effectiveness assessment was not carried out before it was scrapped. The original plans were to run the scheme for 6 years, which could have effectively have changed the fortunes of quite a few failing schools across Wales. The original good intentions were there to try and replicate schemes ran in London and Manchester for failing schools, which have had success. So yes, I can’t help but feel frustrated by the whole thing. It paints a picture of Wales being a second tier country for educational excellence if we can’t even run/fund school improvement schemes properly. Alunh I agree with most of your comments. However, many parents in Wrexham are making a choice about where to send their children. For example, every morning hundreds of children are picked up from the Borras, Barkers Lane, Acton, and Garden Village areas of Wrexham, which are in the Rhosnesni High School catchment area and are taken by bus to attend Darland or the Maelor. Parents have the right to do this and are prepared to pay the associated transport costs. They are choosing to send their children to a school on the outskirts of Wrexham which does not have the same social mix as the town centre school. They believe that their child will receive a better education and experience less anti-social behaviour. As a result of this Rhosnesni and other town centre schools no longer have the balanced catchment areas and a good social mix of both pupils and supportive parents that is required in order for a comprehensive school to be successful. Of course I also realise that parents who live in the Llay, Gresford, Marford and Rossett areas, which are the Darland catchment area, prefer to send their children to Castell Alun, St Joseph’s, Bishop Heber and King’s School in Chester. As Helen says, parents are prepared to send their children to schools further afield in order to ensure a good education. The statement above also shows that those are also of the more affluent parents as they have not added to free school dinner statistics. This does not bode well for town schools. The children have nothing to aspire to. Caring parents who made wrong choices will continually kick themselves for doing so. In my opinion, it all went wrong when the word ‘SUPER’ in schools was deemed to mean excellent. The whole picture is completely damning, poor parents can’t afford the additional transport costs to send their kids to the better schools that are outside of their catchment area and means they are forced to take a worse education option. It’s ridiculous that town centre and suburban children are having to go to rural schools to get their education. There’s surely an argument for actually investing locally in the town centre schools and reversing the exodus. There’s actually an aspirational working environment emerging in Wrexham with all these new financial service providers – of course Moneypenny, Thomson Reuters on the industrial estate and the Development Bank of Wales setting up here and I imagine the town’s long term goal is to build quite a cluster of these professional type services alongside other entrepreneurial start-ups. However, in order to build this up, they need to attract the professional workers who have the skills to fill these posts. As it stands the middle of Wrexham will be an undesirable location to relocate to housing-wise if they have families and children and there are no conveniently placed centralised secondary schools. Not everyone is prepared to do a daily large school run or pay for extra transport costs to get their kids to school, so will consider jobs in other towns/cities instead. 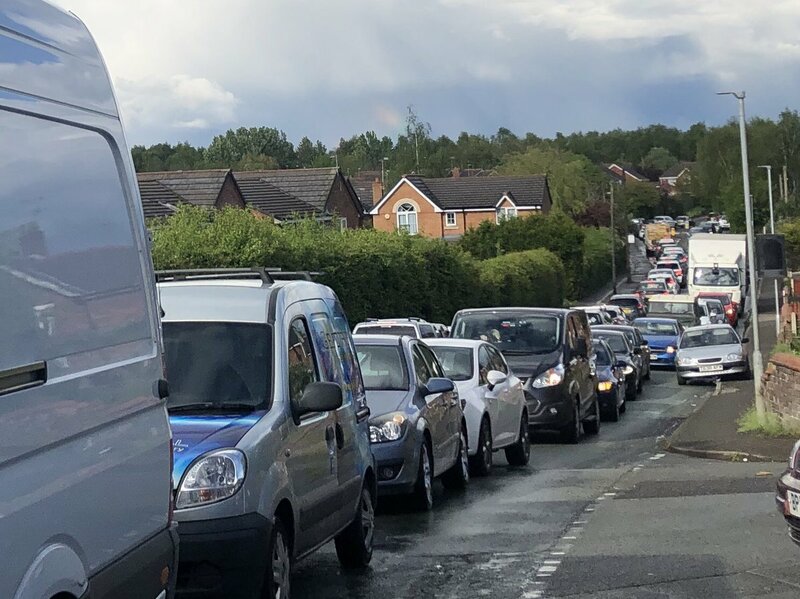 It also forces everyone further out and pushes up rural affluent house prices further, which in turn makes the overall rush hour traffic worse as there are countless people commuting into town and countless people doing a school run out of town. The establishment of 1 or 2 schools of excellence in the middle of town would provide a strong economic pull factor. The establishment of stronger centralised schools would also link in with the strong Tertiary ecosystem currently in place in town (Cambria/Glyndwr) as perhaps they could follow up a strong apprenticeship style skills programme from 14 up (subject to Welsh curriculum restrictions) all the way through to finding them a placement and hopefully a permanent job with a decent set of skills to get on in life. I appreciate these are all by and large ideals, but there has been nothing solid put forward either by the council or the Welsh assembly to actually help get our local failing schools and “educationally poor” children out of trouble. Of course the real kick in the face was the fact that the SUPER schools were meant to be all that in terms of hype, but were just a move to bump 3 school sites into 2 without any real thought about what this might do to the local education ecosystem. I have noticed that pupil numbers in Rhosnesni have dropped right off down from 1,150 before the “disaster inspection” down to 647 in total in 2017! That figure has almost halved and if things carry on and people don’t want to take their children there due to its awful reputation then the school will be forced to close down and the council will then be faced with expensive transport costs of sending the underprivileged children to other schools across the county, of who won’t like it one bit as they’ll be worried about their standards slipping, but it will be forced on them. I didn’t see a major problem with children attending the school in their catchment area taken from the feeder schools. At least it was mixed ability in the schools. There are very bright children who never stand a chance the way things are. Because they come from a ‘poorer’ background should make no difference to their education. When they mixed with more affluent children it gave them something to aspire to. If school dinners were free to all there would be less of the ‘them & us’ attitude too. Children are already classified from a very early age in pre-school classes. Either all should pay or none.